I have a great respect for James Franco. I have great respect for anyone who tries to balance completing a university degree with a full time career. Could you imagine trying to complete a university degree while being one of the most popular male actors on the planet at the present time? Franco must have wanted a challenge, but good on him! He started acting while completing his Creative Writing degree at UCLA and he is currently enrolled at NYU's Graduate Film program and Columbia University's Graduate program for Fiction Writing. That's what I love, when an actor appreciates the art form behind what they do and continues their education in what they love. That is not all I appreciate about James Franco. He loves to take risks. He was critically acclaimed for his role of James Dean in the TV movie of the same name, Harry Osborn in the Spider-Man trilogy, the lead male role in "Tristan + Isolde" and of course, as Aron Ralston in his Oscar nominate role in "127 Hours". The scope of his acting roles is very impressive. I think we need to give him a break in regards to his performance as an Oscar host. He wasn't Billy Crystal, but there are not too many people who could do the job that Franco did in front of the whole world. And there isn't too many people who could host the Academy Awards and be at class the next day. Kudos Franco! I have to mention one of my favourite Franco roles, as himself in "30 Rock". Yes, I am a big fan of "30 Rock" in general so that may contribute to the fact that I find the idea of Franco having to find a fake girlfriend in order to cover up the fact that he is in love with a Japanese body pillow extremely hilarious. "Howl" proves that it is possible to be captivating and weak at the same time. It is not boring and not slow, but it is also not suspenseful and not powerful either. It is extremely unusual for a film to be all of these things at once, but then "Howl" isn't an ordinary film. The elements that go into making "Howl" the film that it is show complete originality and creativity. "Howl" is almost two stories in one, with the centre of the film being Allen Ginsberg's poem, "Howl". 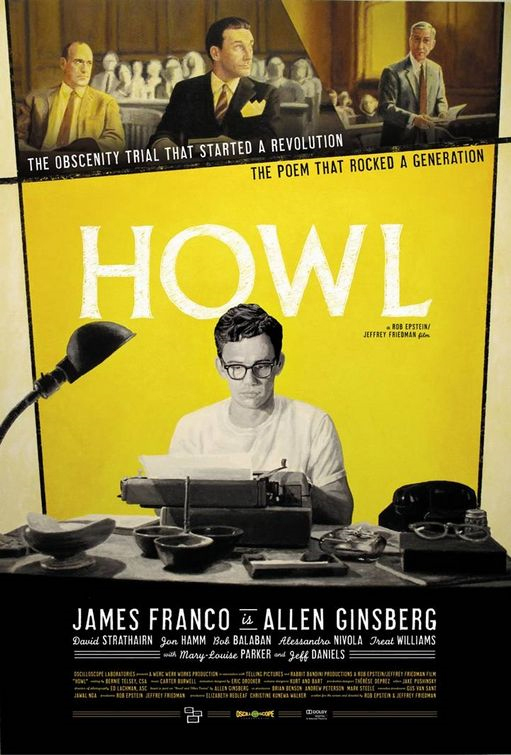 From one angle, the film is about Allen Ginsberg (James Franco) and his life, specifically focusing on his life and loves in the time in which "Howl" was written. While Ginsberg talks about his life from his New York apartment, on the other side of the country in a San Francisco courtroom "Howl" is on trial. The question is, is "Howl" a work of art, or just a work of obscenity? The people who will find "Howl" the most interesting are literary fans and fans of James Franco. People who don't fit into these categories will most probably find this film bizarre and lack lustre. It is the biopic aspect of this film which makes the film bearable. "Howl" would have perhaps been more of a success if the whole film had in fact been the story of Allen Ginsberg and the courtroom drama been left out. You can see what directors, Rob Epstein and Jeffrey Friedman are trying to do by trying to capture what "Howl" meant to the poet and the readers and the cause and effect, but they would have been better to have left it at the poet. The courtroom scenes have no suspense, no drama, no depth, the acting is poor and the best thing that comes out of these scenes is that you find out what makes a piece of writing credible. However, the scenes with Ginsberg are quite enthralling and the animation segments are almost hypnotising. It is a surprise to those who had not heard much about the film beforehand to find so much simple yet brilliantly creative animation involved in the film's editing and cinematography. Franco's performance of Ginsberg is fantastic. He becomes Ginsberg in this role and masters his voice and tone. He can also be quite heart breaking in some flashback scenes, such as when he realises that his lover has left him. Franco makes Ginsberg's character lovable and brings emotion to the film. In short, he saves the film. "Howl" is quite simple, but it is not hard to determine that it wasn't supposed to be. It is obvious that it was supposed to work as a film in two parts, yet one part of the film fails to really do anything at all. Epstein and Friedman should thank those at The Monk Studios for their amazing animation and James Franco for his accurate performance for the successes in this film, as without them "Howl" would be completely unfulfilling.